In our lab, we study landscapes as complex human-environment systems. Most of our projects involve taking a systems-level perspective to a problem in environmental management or conservation, and seeking innovative ways to find solutions that incorporate the knowledge and perspectives of different stakeholders. We usually use spatial, agent-based models to help us find these solutions. Browse this page to learn more about our current projects. 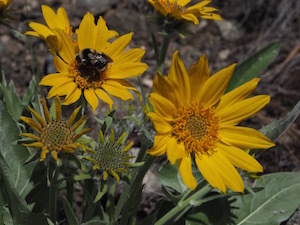 Funding sources: Natural Sciences and Engineering Research Council (NSERC), Regional District of Central Okanagan (RDCO), Okanagan Collaborative Conservation Program (OCCP) and South Okanagan Similkameen Conservation Program (SOSCP). Collaborating organisations: Regional District of Central Okanagan (RDCO), Okanagan Collaborative Conservation Program (OCCP) and South Okanagan Similkameen Conservation Program (SOSCP), BC Ministry of Agriculture, BC Parks, Okanagan Basin Water Board, BC Ministry of Forests, Lands & Natural Resource Operations (Ecosystems Branch), and Environment Canada. Summary: What kind of future do we want for the Okanagan Basin? In the face of a growing population, can we maintain a functional, mixed-use landscape or will the Okanagan become like many other Canadian urban landscapes? How can we best optimize land use to maintain the ecosystem services and quality of life that we value in the valley? What would an environmentally sustainable Okanagan landscape look like? These are questions to which the Okanagan Futures project hopes to respond. The choices we make today influence the choices available to us in the future. Since land and resources are limited, decisions about how to allocate land use (for agriculture, for housing development, or for parks and conservation, for example) result in necessary trade-offs between the different ecosystem services the landscape provides – such as food production, clean water provision, and biodiversity conservation – that directly influence quality of life in the valley. The objective of the Okanagan Futures project is to study and model the different probable, possible and plausible futures for the Okanagan basin and to develop a public dialogue about the landscape’s capacity to support a growing human population while maintaining important ecosystem services. The project study area includes the entire Okanagan Basin, extending from north of Vernon to the Canadian-US border and thus includes agricultural, forest, grassland and urban land areas on private and public land. The intent is to provide a vision for integrated land use planning in the basin, bringing together stakeholders from multiple sectors. The methods involve performing a landscape futures analysis for the Okanagan basin, integrating geospatial data, land use change simulations, climate change modelling and ecosystem services mapping to explore the trade-offs inherent in different human land and water use scenarios on the production of ecosystem goods and services in the basin. 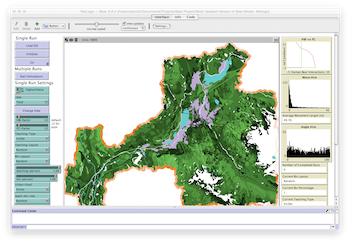 These tools will be used to quantify the limits of the landscape to support human population growth and to identify the scenarios that lead to the most sustainable future landscapes for the Okanagan. As part of this project, we are working to identify key areas of habitat and wildlife corridors that contribute to the ecological resilience of the landscape. Click here for more information about our habitat connectivity work for the Okanagan. Students: Corrie Allen (MSc student), Jonathan Bepple (MSc student, graduated), Katey Kyle (graduate research assistant), Christopher Kyle (research technician) and Rachel Field (PhD student). Click here for posts and updates on this project. Collaborating organization: Margo Supplies Ltd.
Summary: Canadian communities with a high urban-forest interface experience frequent visits from wildlife, including bears. When bears frequent a human environment, they often become habituated to humans and to human sources of food, creating safety concerns for both the bears and humans. This project focuses on how to reduce the number of bears that become habituated by using deterrent strategies and tools to keep bears away from the urban environment. Doing so requires taking a landscape-scale approach to wildlife management that considers the configuration of the urban-forest interface and uses a combined strategy of attractant removal and judicious placement of deterrent technologies such as exclusion fencing and noisemakers. In this project, we are working with Margo Supplies of High River, AB to develop a modeling platform that can be used to explore the effects of different management scenarios on the number of human-bear interactions (HBI) for a given community. We use an individual-based modeling approach to simulate the movement of bears foraging on a landscape. In this first phase of the project, the model is being developed and tested for the Resort Municipality of Whistler, British Columbia, a community that experiences a high number of HBI. Our long-term intention is to continue to collaborate to develop a modeling platform that Margo Supplies can use for providing wildlife management assessment services to communities throughout Western Canada. The project will lead to better protection for bears and humans in Canadian communities. Summary: The Project will map the historical, current, and projected future distribution and value of Ecosystem Services (ES) for the Okanagan Region in British Columbia and develop a strategic policy framework for sustaining ES in the region given current and projected future land use change. 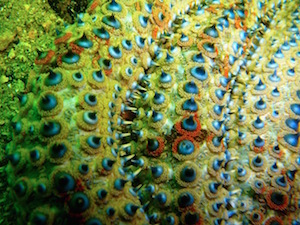 Ecosystem services (ES) are the benefits that humans obtain from ecosystems, and fall into categories of provisioning (e.g., food, water and fibre), supporting (e.g., habitat for biodiversity), regulating (e.g., erosion control, flood protection) and cultural (e.g., spiritual and physical well-being, aesthetics, recreational opportunities) (MEA 2005). The concept of ES provides an explicit link between humans and their environment, evoking the dependence of human populations on their ecosystems for quality of life and well-being. Increasingly, land and resource management policies seek to internalize ES into on the ground planning, however few methods exist for mapping and quantifying ES in a Canadian context. 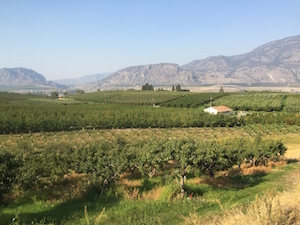 The Project will use the Okanagan Region in British Columbia as a pilot region to demonstrate the advantages and limitations of the ES approach in informing environmental conservation and planning decisions. The Okanagan region is an excellent candidate for a pilot project due to the strong engagement of regional stakeholders and the critical need for concerted, region-wide land use planning to accommodate rapid rates of land development in response to a human population growth rate which is currently one of the highest in Canada. ES in the Okanagan have been estimated to have a value of $6.7 billion/year (Parrott, 2014). Once mapping is completed, an environmental policy framework document will be produced to outline priorities and options for identifying, conserving and restoring natural areas that provide ES. This project is associated with the Okanagan Futures Project. Summary: Understanding the factors that contribute to community resilience to natural disturbances and environmental change is increasingly important for informing policy that seeks to enhance livelihoods and opportunities for Canadians living in resource dependent rural communities. 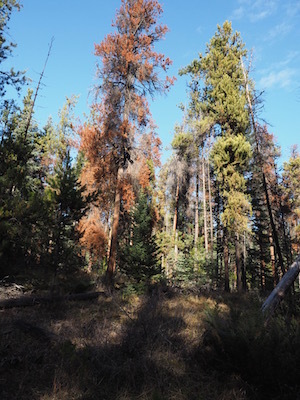 The recent mountain pine beetle (MPB) outbreak in Western Canada is one of many disturbances affecting our forests, with potentially devastating social and economic impacts for some communities. In Alberta, the degree of vulnerability of communities to the MPB outbreak will depend on their degree of reliance on the forest ecosystem for their livelihoods and well-being, and on their ability to adapt and transform in response to a changing ecological landscape. This ability is related to community resilience, defined as: “the existence, development, and engagement of community resources by community members to thrive in an environment characterized by change, uncertainty, unpredictability, and surprise” (Magis, 2010). The objective of the proposed research is to identify the factors that contribute to resilience in communities that are either already affected by the MPB outbreak or are in the early stage of being impacted. Our study communities are Jasper, Hinton and Rocky Mountain House/Clearwater County, Alberta. Funding source: TRIA (Turning Risk Into Action) for the Mountain Pine Beetle Project, funded by the Natural Sciences and Engineering Council (NSERC) of Canada’s strategic network program from 2013-2018. TRIA Net is a consortium of researchers from universities across Canada plus non-academic partner organizations. Summary: The current mountain pine beetle epidemic has affected more than 19 million hectares of forest land in western Canada to date, mainly in British Columbia and Alberta, resulting in mortality of over 1 billion cubic metres of mature pine trees, devastating pine forests in western Canada. In addition to affecting timber volumes, mountain pine beetle infestations impact the availability of species habitats, recreational opportunities, hydrological cycles and a range of ecosystem services on the landscape. In this project, we are applying our expertise to analyse landscape-scale impacts of the MPB epidemic on ecosystem services, and assess the vulnerability and resilience to these changes of communities located in areas of predicted range expansion. 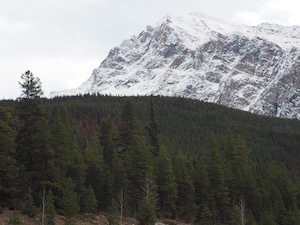 The methodology includes 1. mapping and modeling the impact of the mountain pine beetle epidemic on multiple ecosystem services across its current and future range in British Columbia and Alberta; 2. assessing and modelling the resilience of landscape-scale social-ecological systems to MPB outbreaks. The results will be used to determine which parts of the landscape predicted areas of spread are the most vulnerable and to identify appropriate intervention strategies and management practices. 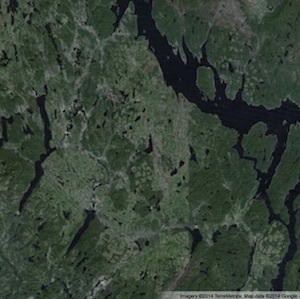 Funding source: NSERC CREATE program in Modelling Forest Complexity. Summary: Forest harvesting activities stimulate the economy of local communities, however there is increasing public demand in Quebec for multi-objective management of forest landscapes that considers conservation, recreation and the maintenance of other ecosystem services in addition to timber. This project will permit the exploration of alternative future scenarios (looking at trade-offs between harvest, conservation and other potential management interventions) for a study region in Québec’s Boreal forest to inform local communities about their options. In addition, it will contribute to efforts of Quebec’s Chief Forestry Bureau to develop more appropriate strategic and tactical planning tools that take into account the spatial distribution of activities on the landscape and their impacts on forest biodiversity, notably the endangered woodland caribou. The project will thus aim to address the following research question: Can harvest plans be designed that ensure caribou conservation, a sustained harvest and recreational use of the forest? A spatial, landscape scale model for a selected forest management unit in Northern Québec that simulates forest growth, harvesting and road construction activities, the activities of human recreational users, and the movement patterns of large mammals in the forest is under development. The project involves coupling an individual-based model of caribou, wolf and moose with a spatially explicit forest growth and harvest planning model and linking this with an agent-based model of human users of the forest. The system will then be used to explore how different spatial configurations of forest harvest and conservation scenarios will affect the viability of caribou populations as well as accessibility of the forest for recreational use. The output of the models will be a series of land use maps and indicators (economic, social and ecological) that can help stakeholders visualise the tradeoffs of different choices. 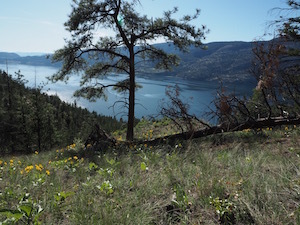 Summary: Using the Okanagan Valley as a pilot region, the main objective of this project is to identify areas of the Central Okanagan Regional District (RDCO) that could be targeted for biodiversity conservation initiative(s) on privately owned agricultural land. Methods include the mapping of ecologically sensitive areas, human land uses, and agricultural parcels in order to identify potential areas that may be targeted for conservation initiatives, with a focus on parcels falling along the Central Okanagan Wildlife Corridor. This corridor spans approximately 70km from Okanagan Mountain Provincial Park to Wood Lake and provides the base area for this project. Results show that the agricultural land within the corridor, albeit relatively low quality for intensive agriculture, offers many ecosystem services at the landscape scale. Furthermore, development of this land could have irreversible impacts on local wildlife populations by threatening the ability for species to move through urbanized areas of the Central Okanagan. While the Central Okanagan Wildlife Corridor largely provides safe passage for species currently, there is reason to believe this passageway could soon become threatened by land use and land cover change. Our project is helping to document the potential impacts of such change on biodiversity and ecosystem services so that policy and best management practices may be implemented to maintain land use on parcels in the corridor that is compatible with ecological flows and processes on the landscape. Summary: The St. Lawrence River estuary is a busy maritime route through which ships transit to reach Canadian and American ports located along the river and in the Great Lakes of North America. It is also home to an endangered population of beluga whales and is used as a summer foraging ground by minke, blue, humpback, and fin whales. A vibrant tourism industry in the region has been built upon opportunities for whale-watching. The high number of whale–vessel co-occurrences cause potential disturbance to the whales and also pose a risk of collisions. We developed an agent-based model, called 3MTSim, to simulate the movement of boats and whales in the Estuary. This model is used by a multipartite working group to simulate and test management scenarios to evaluate their effectiveness in meeting multiple objectives. In 2013, the group recommended voluntary measures for speed reduction and area avoidance to reduce whale exposure to vessels and decrease the risk of whale–vessel collisions. 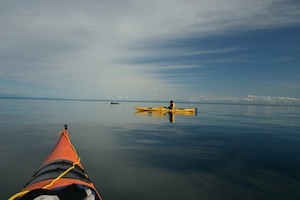 The measures are communicated to mariners each year by the Canadian Coast Guard and have received high compliance. This is a successful example of how nonregulated solutions can be achieved through collaboration and cooperation between diverse stakeholders.